Being famous for its natural scenery of mountains and rivers, bringing a great unspoiled beauty, Ca Du (Cà Đú) waterfall located in Tra Thuy (Trà Thuỷ) commune (Tra Bong (Trà Bồng) is an interesting destination of many tourists to go for excursions and sightseeing. This is considered as one of the exotic places that the Mother Nature has bestowed the mountainous district of Tra Bong. Located about 60km away from Quang Ngai (Quảng Ngãi) city and about 4km from Tra Xuan (Trà Xuân) town, Ca Du waterfall is the choice of many travelers both inside and outside the province to go sightseeing due to its poetic beauty, particularly in the summer days. From the pretty small mountain town of Tra Bong, you can clearly see Ca Du mountain towering alongside Hon Ba (Hòn Bà) and Hon Tron (Hòn Tròn). At the height of thousand meters, a small rocky stream flows down the valley. Here, the stream suddenly drops creating a steep waterfall that the flows of the stream heart are manifold sorted rocks. There are many waterfalls in the districts of Quang Ngai (Quảng Ngãi) and neighboring provinces, but few places are great like this one. During the rainy season, the water flows are strong and clear. As dusk, under the lush mountains, Ca Du waterfall is like a giant pan of constant sparkling honey. 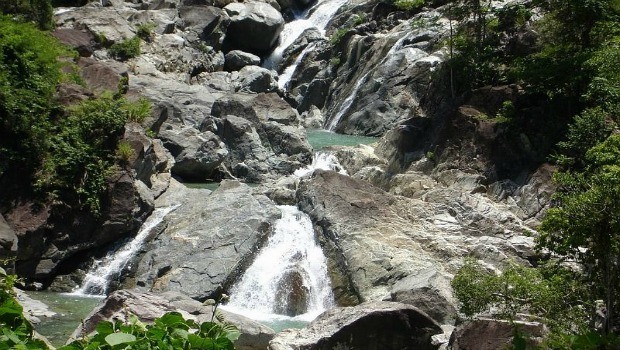 With natural space and primitive ecosystem, the pristine and pure, when firstly coming here, tourists will be attracted by the green of mountains from the height of thousand meters, the sparkling silver-like flowing water swept through huge stone blocks creating the majestic waterfall like Ca Du nowadays. In the eyes of tourists, an unspoiled natural space: mountain stream – waterfall – trees….is opened in an enchanting way. The limpid water bends like ribbon flowing from the mountain. On the rolling mountains, many types of crops are alternated creating a giant, endless green carpet. All of them seem to mix together, making nature, earth and the sky here become very fresh and airy. There is nothing more interesting than leaning back under the shade of trees, dipping yourself in the crystal clear stream, listening to the symphony of birds and water, watching the shimmering white cascade foaming water. The scenery here is really a wearing picture, pained beautiful nature scenes, thereby giving people visiting here a peace of mind. Due to the pristine beauty of this place, on the holidays, weekends, particularly in summer, many young people often visit, enjoy the waterfall. Coming here, tourists could sit on the large stones to enjoy the local produce. Visiting Ca Du waterfall, tourists apart from sensing the rustic, pristine beauty of the scenery also discover the life of Kor ethnic people with featured customs and traditional practices which are carefully preserved and promoted. 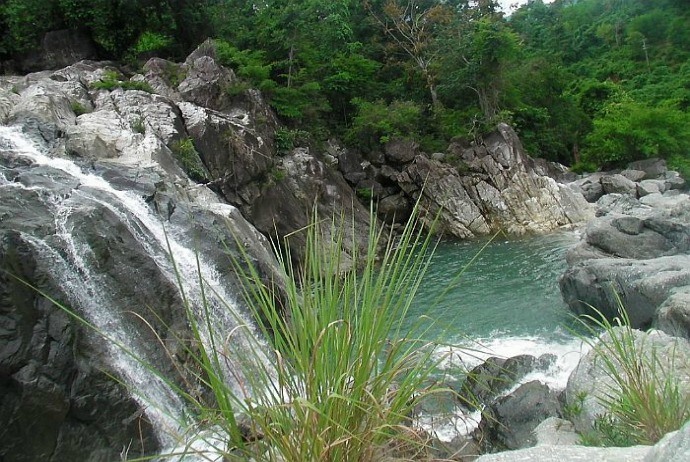 Pristine, peaceful and romantic – that is what is left in tourists when it comes to Ca Du waterfall. The winding roads, stretching rocks and the green of mountains and forests will still urge tourists to discover.